And your followers can get the latest trends in real time! I wanted to create a page for my readers that kept them up to date in real time on all the trends I'm following. What better way to do so than to embed my Pinterest Boards onto a page in my Squarespace site? When it comes to trend research I'm ALWAYS on Pinterest. It serves as the best platform to collect images and discover new trends in color and design including: illustration, surface design, print, pattern, and textile design. The great news is: this is realllly easy to do with your Squarespace website! First, you want to double check your Pinterest account and make sure you're logged in to your Pinterest business account. If you don't already have a Pinterest Business account, you can create one here. Next, go to the Pinterest Developers website (click link). Click on Tools. And voilá! You've arrived at the Pinterest Widget Builder. Check out the navigation directly under Widget Builder. Click on the type of Pinterest Widget you'd like to create. Do you want to create a Pinterest Save Button? Maybe you'd prefer to create a Pinterest Follow Widget to embed by your blog profile. Pinterest gives you options to create a widget for a single pin, a board, or your entire Pinterest profile. For me, the best option was to create a widget for individual Pinterest boards. From there, I went over to my Pinterest profile and clicked on my Pinterest Boards. I browsed my boards and found one that I wanted to create a widget from. I highlighted the URL of my Pinterest Board and copied it. 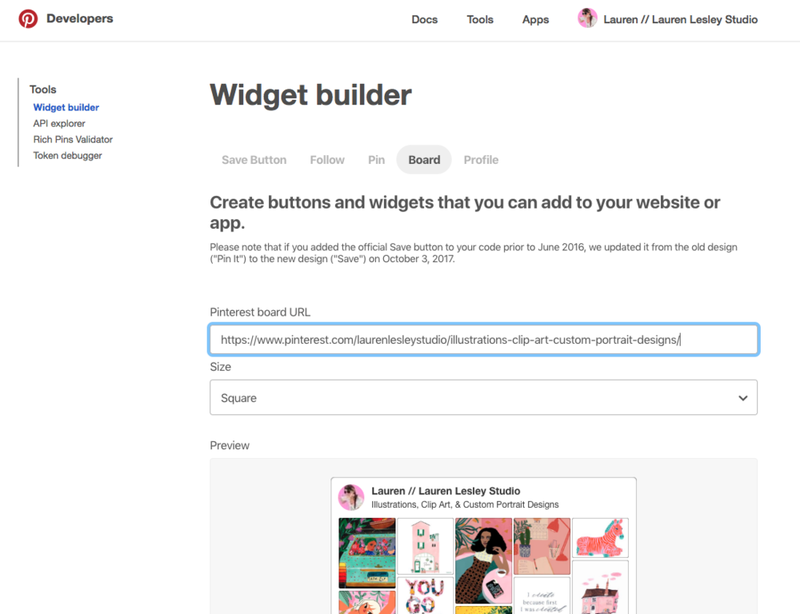 From there, I pasted into the Pinterest Widget Builder. You'll see a preview appear and a drop down menu for the size you want your Pinterest widget to be. Size options include square, sidebar, header, and create your own. I used the "create your own" option and played around with the sizing until it looked right. Now, it's time to play with the code! The first step is to copy the 2nd piece of code and head over to your Squarespace site. Create the page in your Squarespace site. I named mine Trend. From there, click on the gear icon. Click on Advanced and paste the code into the PAGE HEADER CODE INJECTION area. Yayyy, now go back to the Pinterest Developers page. Copy the 1st piece of code for your Pinterest Board Widget. Now, go back to your Squarespace website and create a block. Select code. Paste the code into your block. BEFORE you hit okay... you'll want to add one more piece to the code to make sure it's aligning centered. Otherwise, it aligns all weird with your page. Add: <center> at the beginning of your code. End with </center>. See underlined in green below. Save your page and hit the Refresh button as the Pinterest Widget won't show up immediately. Save yourself the research by downloading my free trend report for 2019! Join the Design Tribe and receive news + updates.